The Rick Pond in Hampton Court Park (also known as Home Park) has been the venue for model yacht racing since the 1890’s. The Rev. Leonard Sampson Lewis-Low founded the Surbiton MYC in 1893, the first club to adopt the water. By the late 1920’s there were three clubs using the lake. The YM6mOA (Yachting Monthly 6 metres Owners Association) was founded in 1924, probably by Mr W J Daniels and Major Malden Heckstall-Smith. In 1923 the Major, whilst editor of The Yachting Monthly magazine devised a formula based on his 18 footer rule (The Yachting Monthly 6 metre). This was on a scale of 2in =1 foot, later known as the international A class. It was devised in collaboration with Mr W J Daniels for a series of international races between England, Denmark, America and countries of the then British Empire. The association’s southerly branch sailed at the Round Pond at Kensington, Gosport and the Rick Pond in Home Park. The headquarters for the YM6mOA was initially at the MYSA at Kensington, but moved to the Rick Pond in 1929 when the boat house was built. The YM6mOA was now recognised as a club with full and associate members. The club raced these newly developed A class yachts until the present day and continue now with both the free sailing and radio classes as Hampton Court MYC. The SLMYC (South London Model Yacht Club) were sailing on the Long Pond at Clapham between 1918 and 1928, when they moved to the Rick Pond. They sailed A class and 10 rater’s before the Second World War, then post-war the club introduced the more popular Marblehead class. By the 1950’s very few 10 rater races were held. The club introduced radio controlled Marblehead’s to its fleet in 1986 and have sailed both the free sailing and radio classes up until the merger between YM6mOA and SLMYC to form Hampton Court MYC. There was also the Surbiton MYC, of which little is recorded. All three clubs had storage facilities. The YM6mOA boathouse was constructed in 1929 at a cost of £250 and was used purely to house the boats. In 1930 the then President of the club, Mr T B Davis, put at the club's disposal £1000 for the purpose of building a clubhouse to adjoin the boathouse. The building was designed by Bill Daniels and consisted of a lobby, kitchen, ladies and gents dressing rooms, a president’s room and a function room. The water supply was pumped to a storage tank by hand from a nearby well. Lighting and cooking were supplied by gas. This was completed in 1931. The SLMYC had a shed like building, quite modest in construction compared to the grand timber building of the YM6mOA next door. The Surbiton MYC had a small brick built building on the Palace side of the lake. The Rick Pond’s water comes from the River Longford which feeds all the ornamental gardens of Hampton Court, flowing down the Long Water canal into the Rick Pond before departing into the River Thames. The lake has a fairly open aspect with mainly prevailing south westerly winds running straight up the length of the pond. The southerly end of the lake was extended by about 100ft in 1931 to 1010ft in length. The most recent change was when the southerly end was filled in returning the lake to about it’s former length. This was to allow avenues of trees to be planted returning the park to the layout designed by Charles II. In 1996 the ground rent for the 2 existing club premises was substantially increased. This encouraged the two clubs to officially merge. 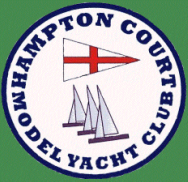 The SLMYC boathouse was demolished and the combined club has been renamed the "Hampton Court Model Yacht Club".